Decent price for a quality branded guitar. 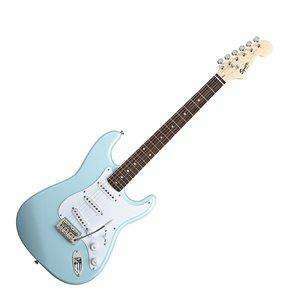 The Squier Bullet Strat With Tremolo is a simple, affordable and practical guitar designed for beginners and students. Classic styling that includes the added benefit of a one humbucking/ two single-coil pickup configuration. Other features include 5-way switching, synchronous tremolo, and a maple neck with rosewood fingerboard and 21 frets. A cheap but resonable guitar, probably better than lots of the cheap package deals. Great for beginners who don't want to be put off by buying something that is almost unplayable. Nothing more than a starter guitar either to be honest. I love my Squier just as much as my high end gear. They're really on top form at the moment so this is a hot deal for a very nice guitar. Suited to all players, not just beginners. I love my Squier just as much as my high end gear. They're really on top … I love my Squier just as much as my high end gear. They're really on top form at the moment so this is a hot deal for a very nice guitar. Suited to all players, not just beginners. Agreed. Excellent guitar. Great action and pickups are more than acceptable for the price. you get good squires but some cheap squires, so cud be best having a look in a music shop rather then buying online. Title should really be Squier by Fender. Great price for a competent beginners axe. At this price it may even be worth grabbing to cannibalize the body (Alder?) and and neck. My first guitar was a Squier and they're great beginners axes IMHO. Far better than these starter package deals you see from Home Bargains etc. They play really well and actually inspire you to pick them up and practice which are the most important things if you're just starting to learn. Great price for a competent beginners axe. At this price it may even be … Great price for a competent beginners axe. At this price it may even be worth grabbing to cannibalize the body (Alder?) and and neck. real title should be squire, licenced from fender. i had a squire and it was pretty shocking, id suggest paying 30 quid for a crap guitar on ebay local and then if its for you spend about 300. I can recommend Freya guitars on Ebay if you're on a tight budget . real title should be squire, licenced from fender.i had a squire and it … real title should be squire, licenced from fender.i had a squire and it was pretty shocking, id suggest paying 30 quid for a crap guitar on ebay local and then if its for you spend about 300. Can see the logic, but I know quite a few people from having worked in the trade who were put off by buying a cr@ppy guitar to start off with purely cos it was so difficult to play! This seems as safe a bet as anything if you're insistant on buying blind from the internet. Personally, i'd take a friend to a music shop and see what's there. and no one needs to spend more than 4 quid on ernie balls, unless theyre recording and want the perfect sound. Can see the logic, but I know quite a few people from having worked in … Can see the logic, but I know quite a few people from having worked in the trade who were put off by buying a cr@ppy guitar to start off with purely cos it was so difficult to play! This seems as safe a bet as anything if you're insistant on buying blind from the internet. Personally, i'd take a friend to a music shop and see what's there. cheap guitars are very hard to play for a beginner. your better of getting a cheap classical guitar for like 30quid and learning on that, see if you fancy it then buy a more expensive electric guitar. This seem to be one of those products which is worth paying slightly more for at your local music shop, for the help they can give you after the sale.... fitting new strings, etc. Bicycles can fall in to the same category. The same website has a range of Epiphone Les Paul Juniors for the same price which seem decent too. For most folk, even beginners it's a personal preference choice between a gibson and a fender so it's great you can now make that choice for only £89. My first guitar was a Hohner Rockwood Les Paul copy, and i still have it now, sat in the corner. No point selling it, it's worth more to me than what i'd get for it! Some beginners guitars are spot on. i've only ever used Super Slinky's, that's fine, but i just wonder why on earth they're using it as a selling point on a guitar that has plenty going for it already. My first guitar was a Hohner Rockwood Les Paul copy, and i still have it … My first guitar was a Hohner Rockwood Les Paul copy, and i still have it now, sat in the corner. No point selling it, it's worth more to me than what i'd get for it! Some beginners guitars are spot on. That's the WORST guitar you could buy for a beginner, a cheap classical? Are you serious? That's the WORST guitar you could buy for a beginner, a cheap classical? … That's the WORST guitar you could buy for a beginner, a cheap classical? Are you serious? ive been playing for years and cant even play an F on a classical. or buy a dirt cheap second hand local pickup. and if you have a friend that plays guitar, get them to set it up for you. ive been playing for years and cant even play an F on a classical.if you … ive been playing for years and cant even play an F on a classical.if you want a cheap learning guitar, get an accoustic, get a steel string, ive got an F310 (about 40 quid second hand)or buy a dirt cheap second hand local pickup.and if you have a friend that plays guitar, get them to set it up for you. Not a bad guitar for the price but the Yamaha Pacifica is a more consistent product if you can find one at a similar cost. Lol @ calling it an axe. It's not the 80s anymore! Not a bad guitar for the price but the Yamaha Pacifica is a more … Not a bad guitar for the price but the Yamaha Pacifica is a more consistent product if you can find one at a similar cost. you'll pay 150 and up for a good one that hasn't been totally trashed..
Another +1 for learning on acoustic. -1 for learning on classical! My first guitar was a classical acoustic, as a young teenager, trying to learn how to play power chords and constantly breaking those thin nylon strings was a nightmare! It's only now I can appreciate a classical guitar. All of my electrics have been Squiers, they are great for beginners, and I merely stepped up the range to one to a Squier Telecaster Custom II, probably one of THE best guitars in the budget arena. If you can stretch to that, get one! What a terrible idea! Starting off on a "30 quid crap guitar" is a surefire way to put a new player off learning! Good guitar, especially for a beginner. If you don't stick with it, you haven't lost a lot of money. What a terrible idea! Starting off on a "30 quid crap guitar" is a … What a terrible idea! Starting off on a "30 quid crap guitar" is a surefire way to put a new player off learning! The first guitar i ever played was my mates Encore Strat copy with some twisted bits of metal claiming to be a floyd rose. It was dreadful, weighed like an elephant and played like a pile of saws. Worst guitar i ever played, but it never put me off. Egged me on if anything! Beginnners guitars these days are awesome compared. I've read a few Total Guitar magazine reviews of Squires put up against other guitars from other brands, and the Squires always seem to win. At Total Guitar at least they seem to think Squire are offering the best budget guitars at the moment. Having said that, my advice to anyone would be to buy a better guitar second hand rather than a lesser one new. Not only are you getting a better instrument for your money, but you are losing ZERO money doing that, because a s/h £100 guitar is still gunna be worth £100 a year from now. The moent you open a new guitar box however the thing has lost at least 33% value right there. As a lot of first time guitar buyers seem more concerned with not wasting money on an instrument that doesn't get played rather than buying something really nice to play, buying a new guitar is just the wrong way to go. First guitar was a Marlin Sidewinder c.1986 pastel green, shortly followed by a Yamaha RGX312.